The undergraduate speakers will describe their senior thesis honors research. This is the final step in gaining an honors degree in physics, and most of them will also be co-authors on a paper published in a mainline science journal. The graduate student speakers are in the middle of their PhD research, and will disucss their progress and their goals. The prize winners are nominated and chosen by the faculty for making particularly noteworthy progress in their research. Graduate student winner Sanchez’ talk is titled “Reconstructing cilia beating from the ground up.” He works in Professor Zvonimir Dogic’s lab studying soft condensed matter. Undergraduate winner Engelhardt’s talk is titled “A New Approach to Solving the Hermitian Yang-Mills Equations”. She works with Professors Matt Headrick and Bong Lian (Math) on problems in theoretical physics and string theory. The schedule for Monday morning and abstracts of all the talks can be found on the Physics Department website. Engelhardt’s research is much more abstract and mathematical, and concerns fundamental problems in string theory, not usually an area tackled by undergraduates. Professor Headrick says “Netta really, really wants to be a theoretical physicist, preferably a string theorist. She has a passion for mathematics, physics, and the connections between them.” He adds that she is utterly fearless in tackling hard problems. Netta has been awarded an NSF Graduate Research Fellowship based on her undergraduate work here. Next year she will enter graduate school at UC Santa Barbara and will likely work with eminent string theorist Gary Horowitz, who has already supervised the PhD research of two other Brandeis physics alumni, Matthew Roberts ’05, and Benson Way ’08. This Student Research Symposium is now in its 20th year. 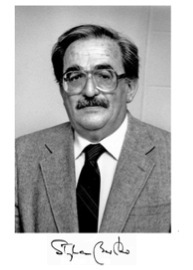 The “First Annual…..” (two words which are always unwise to put next to each other) was initiated in 1992 by Wardle to honor Professor Stephan Berko, who had died suddenly the previous year. Family, friends and colleagues contributed to a fund to support and celebrate student research in his memory. This provides the prize money which Netta and Tim will share. Stephan Berko was a brilliant and volatile experimental physicist who was one of the founding members of the physics department. He was born in Romania in 1924 and was a survivor of both the Auschwitz and Dachau concentration camps. He came to the United States under a Hillel Foundation scholarship and obtained his PhD at the University of Virginia. He came to Brandeis in 1961 to establish a program in experimental physics and worked tirelessly to build up the department. Together with Professors Karl Canter (dec. 2006) and Alan Mills (now at UC Riverside) he established Brandeis as a world center for research into positrons (the anti-matter mirror image of ordinary electrons). In a series of brilliant experiments they achieved many “firsts,” culminating in election to the National Academy of Sciences for Steve, and, it has been rumored, in a Nobel Prize nomination for the three of them. Steve was as passionate about teaching as he was about research, and when he died, it seemed most appropriate to honor his memory by celebrating the research of our graduate and undergraduate students. During the coffee break on Monday, we will show a movie of Steve lecturing on “cold fusion,” a headline-grabbing but phony claim for producing cheap energy from 1989.